Sign up for the Windows Insider Program for new user. Click one of the Download links on page here to download ISO file. Once download is complete, transfer the ISO file to installation media such as a bootable USB flash drive or DVD. Boot PC from the installation media, and then follow the in-screen step by steps instruction to perform a clean install. or enter a valid product key of genuine Windows 7 or Windows 8/8.1 operating system. 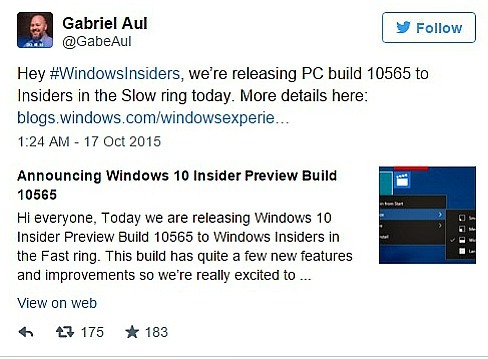 Windows 10 Build 10565 ISOs files are available in x86 and x64 in 23 language/region from Chinese (simplified) to Czech. Features of Windows 10 Build 10565 include updated new icons, improved context menus on Start menu, more colourful title bars (adjust the color by going to Settings > Personalization > Colors), easier to activate Windows 10 on devices by using existing Windows 7, Windows 8 or Windows 8.1 product keys by going to Settings > Update & security > Activation and selecting Change Product Key. In addition, Cortana can now understand notes that user inked or written and Desktop Windows 10 10 users can preview Skype messaging, calling, and video capabilities via Messaging, Phone and Skype video universal Windows apps. Context menus are now smaller so they’re easier to use with a mouse. Users can pin contacts to the Start menu from the People app. Hiding desktop icons via the Context menu now works. Windows Store apps are now updating automatically. Warning message no longer appear in the Settings app > Update & Security > Windows Update regarding changed ring settings for preview builds unless user change ring settings.